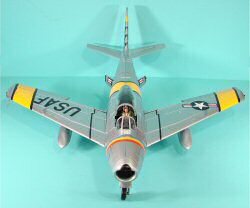 Those of you who've been keeping up on the latest cool releases from 21st Century Toys know that their primary focus had been on World War II subjects, the P-51, Bf 109, F4U, P-40, Fw 190D-9, P-38, TBF, and more. More recently, they broke from their WWII streak and released that magnificent F-104 Starfighter. So what could they do next to get peoples' attention? The Korean War! 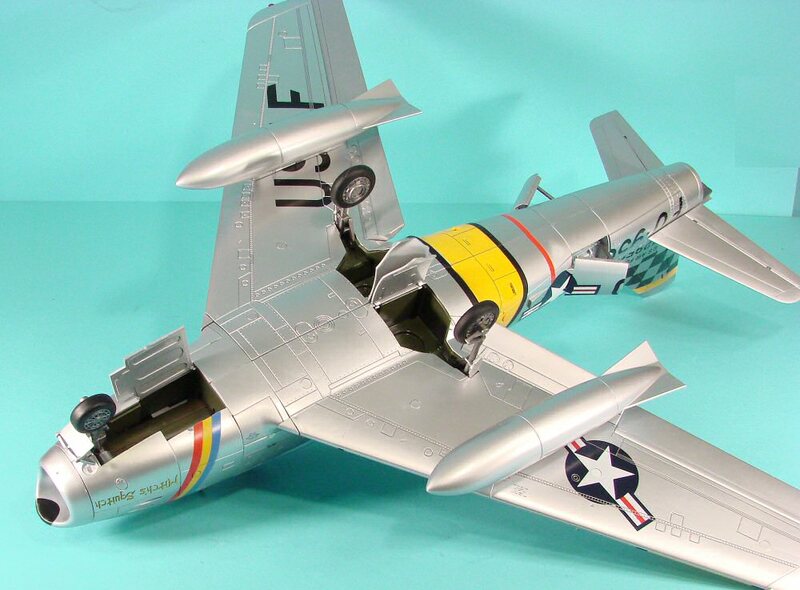 We previewed the MiG-15 and F-86 at the Chicago Hobby Show back in October and they looked pretty nice then. We recently had the opportunity to review the first MiG-15 release here and now we have the F-86F as well! The aircraft is packaged in the standard rugged box and carrier tray. The fuselage, wings, horizontal stabs, external tanks, and pilot figure are all wired into place to ensure safe transport. A bag of parts are taped to the underside of the tray containing an external fuel tank, Sidewinder missiles on pylons, pilot parachute, O2 mask, pilot stand, and pitot tube. As I've learned from previous experience, the quickest way to gratification is to use wire cutters to clear the transport wires out of the way and carefully remove the parts from the carrier. I had absolutely no damage on my example. Unlike the MiG-15, this one takes a little more to assemble, but if you do the unmanly thing and read the instructions, you won't have any problems. The left and right wings have a rather ingenious slotted joint that is held together with three screws. The wing assembly then slips into the underside of the fuselage and is held in place with two more screws. The two underside screw holes are then plugged with provided styrene plugs. The main landing gear comes down with no problems and the down-locks are the now-standard design used by most of the recent 21st Century Toys releases. These are easy to engage and disengage, but keep the gear locked down when employed. The nosegear is a complex affair. It retracts sideways into the well as with the full-scale example. The main door opens to one side while the strut doors are articulated together. Somehow 21st Century Toys figured out how to recreate these details into a working replica. Nice one Roy! This offering includes your choice of external tanks or Sidewinder missiles on launch rails. While the missiles are supposed to plug into the same holes as the external tanks, set these aside for the Korean War birds. First, the Sabres of the Korean War didn't have the Sidewinder (though it would have been nice!) and second, the use of Sidewinder wasn't a tradeoff against the external fuel tanks. The Sidewinder missile rails were actually mounted inboard of the external tanks. A note on the pilot figure - this is another one of the first figures that effortlessly drops into the pilot's seat without dislocating a shoulder or hip. 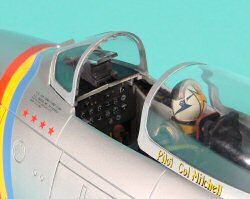 I don't know if this is due to a redesign of the cockpit or the figure, but kudos in any case! 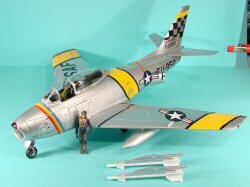 Speaking of pilots, this is Mitch's Squitch, the F-86F flown by Colonel John Mitchell who was the wing commander of the 51st FIW and had gained four MiG kills. What isn't shown on his kill board is his real claim to fame - he led the team of P-38 Lightnings that downed Admiral Yamamoto over the Pacific in World War II. 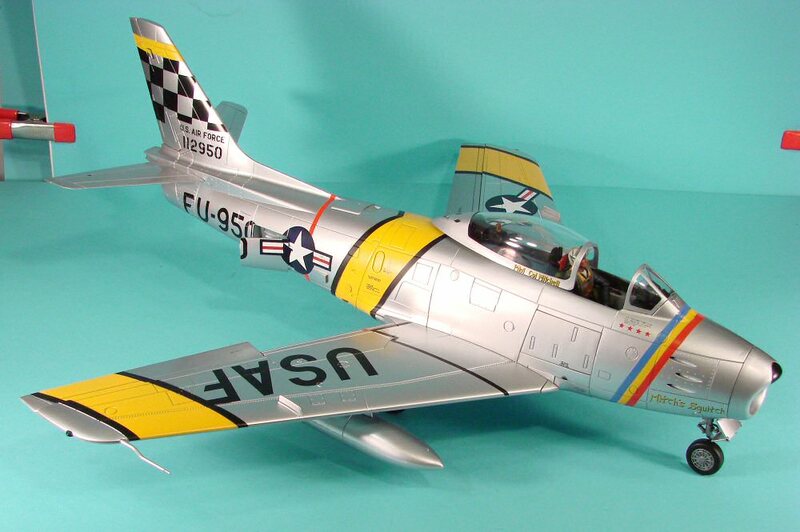 This airframe is as nicely engineered as the MiG-15 and finished every bit as nicely. You'll enjoy having this large-scale Sabre hanging from your ceiling chasing the MiG-15 (or vice versa). You can find these at any one of the retailers listed on the 21st Century Toys website.